Lauren went to Dev’s to pick up Feather yesterday. 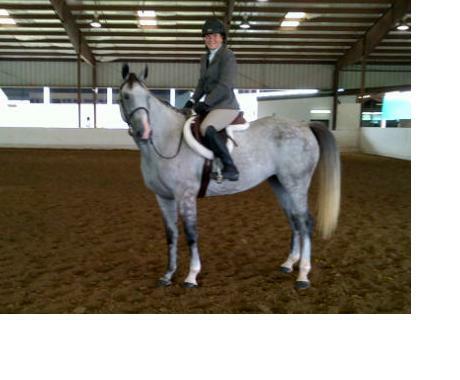 She took Feather and one of Dev’s client’s horses to Katy, Texas for the horse show. First off, Feather loaded first try which was a great way to start off the day. When they got to Katy, Feather was noticeably less stressed than she had been on previous trailer trips. Lauren got Feather settled in and then saddled her for her first ride in huge, covered arena. I am pretty sure Feather has never been in such a space before. She definitely looked things over, but was not overly spooky or frightened way. Lauren did well enough with her on the flat, that Dev decided to add some jumps. It was a little rocky to start as they got their rhythm going, but quickly, Feather was jumping well in the new ring. Lauren called me at work and I could hear that little hitch in her voice when she is trying not to cry. She was overwhelmed with emotion, good emotion, great emotion, that this grey mare was doing so well for her. Lauren was receiving compliments from other riders and people whose opinions were important to her. We both knew it was just a start, but it was a good one for both of them. Dev decided the mare could do two over-fence classes and then the one flat class. Feather is not in shape yet to do anymore than that and we did not want to tire her or potentially hurt her. We left the house about 5:30 am today to make the trip north to the equestrian center. It wasn’t long until the much-anticipated debut in the ring took place. I just could not get over how pretty Feather looked. For the show, the horses are washed, brushed and clipped. They wear their best saddle pad, show bridle and saddle. I guess I had not stepped back to see how pretty she has become or how grown up. Her shoulders are sturdy and square. Her weight is good and she has started to gain some mature muscle mass. Plus I think she is just cute! Their first round was a little choppy. There are a lot of details to master and Feather is not there yet. But since her first full round of jumps was yesterday, no one was more thrilled than I to see her easily and gracefully clear each jump. Absolutely, we have work to do but she was amazing for a first time jumper. The division was aptly named, “Green as Grass” and she certainly was. Her second round was not as good, Dev and Lauren blame me because I standing in the viewing area and Feather came around to the jump near me and tried to cut out (running from Granny, Feather?) but the good part was, Lauren easily brought her back around and she jumped without a further look in my direction. There were a lot of horses to see today and it was after noon before we got into the ring for the flat class. Certainly, Feather has never done this before and there was a lot that could have gone wrong. There were 13 horses in the ring with her. All young and green as she is. Yet, she walked, trotted and cantered (correctly) as the judge asked. The flat class was over ten minutes long (that’s long) and Feather did get a little fussy, throwing her head a bit and showing her impatience for it all to be over. The last thing the judge asked is for the horses to line up, with their backs to the judge. All I could think of was, whoa, we never practiced this before. But she went and stood shoulder to shoulder with some pretty fine horses. In the end, while we did not earn a ribbon for the jumping effort, Lauren and Flagmount’s Irish Freedom (her show name) were seventh in the flat class. I was a pretty proud mama, carrying Feather’s very first ribbon back to Lauren. I think we really might have a nice horse and am so excited to see how far we can go with her. What a wonderful, wonderful feeling to see her mature and grow like this. Oh, and it was pretty terrific to see my daughter back in the saddle and excited about this young mare. I am thankful for many things. I’m so glad it went well today!! She looks soo pretty! Thank you!! Snow had a great weekend but was missing his JoJo.